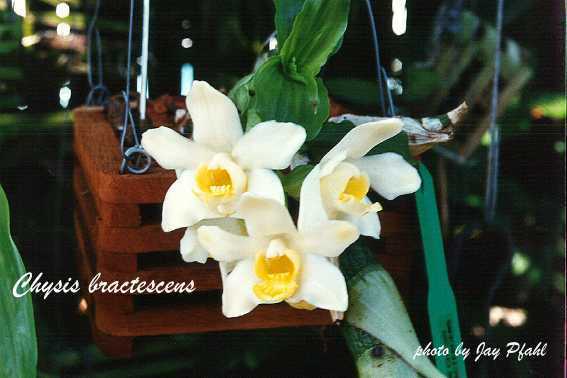 Chysis SITE LAST UPDATED 11/07/97 This Site Dedicated to Orchid Lovers Everywhere! Chysis Page SUBFAMILY Epidendroideae, TRIBE Arethuseae, SUBTRIBE Bletiinae. Chysis is a genus of six or more epiphytic or lithophytic plants found from Mexico south to Peru and east to Andean Venezuela. Chysis is characterized with clustered fusiform pseudobulbs, with distichous and plicate leaves. The inflorescence arises from the side of the old pseudobulb and is laxly racemose and gives rise to a few showy flowers. - Mexico to Nicaragua - Alt 0-850m - Flowers in Mar-Apr.